Coilhäusers, I’ll be in D.C. much of this week and will hopefully have a little free time. I’d love to meet some of you dear readers in person. Contact me at ampersandpilcrow [at] hotmail [dot] com. Reich tore out of Personnel and over to Sales-city. The same unpleasant information was waiting for him. Monarch Utilities & Resources was losing the gut-fight with the D’Courtney Cartel. There was no escaping the certainty of defeat. Reich knew his back was to the wall. He returned to his own office and paced in a fury for five minutes. “It’s no use,” he muttered. “I know I’ll have to kill him. He won’t accept merger. Why should he? He’s licked me and he knows it. I’ll have to kill him and I need help. Peeper help. It’s a story old as a thousand distinguished corpses in a thousand drawing rooms: murder. Alfred Bester’s futuristic murder tale The Demolished Man won the first Hugo award in 1953. At the time, that may have come as something of a surprise, seeing as the novel isn’t an operatic space epic. But then, it’s no typical whodunit, either. Bester has set his story in a World of Tomorrow (!) where rockets can get you anywhere and telepaths have so suffused society, there hasn’t been a murder in over 70 years. That’s not going to stop Ben Reich, though. Oh, no. The business mogul happens to be a wee bit of a sociopath, to put it mildly. He’s decided his similarly insane rival must be done away with. The novel opens with Reich plotting his crime and focuses not on whodunit, but on the mind-reading investigator Lincoln Powell’s cat-and-mouse game with Reich, as well as the unraveling of more complex reasons behind the crime. Many, many once highly-regarded tales from sci-fi’s earlier eras haven’t held up well over time. But with this book, Bester took a quantum leap ahead of his. Building from pulp foundations, he stirred in a heaping helping of noir, innovative style, vicious humor and, for kicks, topped it all off with help from the gravitational pull of Sigmund Freud’s looming, dinosauric cigar. The resulting book was written a decade before sci-fi’s Deviant Age came roaring to life, but it’s deviant in all the best ways, and has only gotten better with age. That’s an actual quote from an early bit in the book where a party of telepathic Espers (“Peepers” to the less refined) are interweaving their thoughts at a dinner party. It’s a testament to Bester’s command of language that this mental/visual/literary back-and-forth is pulled off so gracefully, serving as an enhancement rather than a distraction. At first, the world he takes us into seems to be one of the typical high tech utopias of its time. There’s space travel everywhere; everything is bigger and more awesome. You’ve got your jet pack, your flying cars and, if not alien dancing girls, a pretty close facsimile thereof. Yet all is not as it seems. In addition to Reich’s murderous plotting, there’s the secretive, eugenics-tinkering of the Esper Guild. Cults are hiding out on asteroids. The urban underbelly setting comes straight from the best traditional noir. Foreshadowing cyberpunk by decades, Bester seamlessly blended high-tech and low culture. In The Demolished Man, the only real difference between the hustling thugs and the tycoons is money, and it’s the kind of book where the straight-arrow hero still has a compulsively lying split personality and falls for the love interest during a lurid episode of Daddy/girl play (necessary for the investigation, of course). In the midst of a perfectly riveting crime story (I’ve never been able to find a wasted scene), there are delightful subtleties and literary touches, like the creepy hypnotic jingle — Tenser, said the Tensor. Tension, apprehension and dissension have begun — that Reich keeps running in his head to fool the peepers. Eventually, the story explodes onto a cosmic scale that reminds me of those cross-over ending showdowns that are now par for the course in comics. That it segues so perfectly here is a testament to Bester’s skill, as is the fact that he goes through about five “WTF!” twists without derailing the story. So maybe the mentally imbalanced characters in Bester’s future weren’t that out of place. Even the less raving sci-fi writers have had their share of quirks. There’s something about playing the future out over and over in your skull that produces a natural breeding ground for salacious weirdos. And you know what? Thank the heavens for that. Amen. Question: A repeated theme in The Demolished Man is how deeply mentally messed up even the seemingly sane characters are. No one fits the ideal, well-adjusted image once you get below the surface. How is the way we deal with and perceive mental quirks and illnesses changing, how should it change? I was waiting for the day you’d cover him for All Tomorrows… and I’m delighted that day has finally come! I have to say, I read The Demolished Man and Stars My Destination at the same time, one right after another. Although I remember enjoying The Demolished Man tremendously, and I remember the general theme of it being a sci-fi noir with telepathy, I don’t really remember much besides. Stars My Destination, on the other hand, had a profound effect on me. To me, it is THE proto-cyberpunk novel. I loved Gully Foyle and his quest for revenge. I remember jaunting. And… oh my god… The Scientific People! “Quant Suff! Most scientific!” One of my favorite scenes of any sci-fi novel, EVER. So I guess I should re-read The Demolished Man so that I can stay on-track with the discussion. Just wanted to share my enthusiasm for Alfred Bester in general. As far as your question goes, I’m not sure. Most people avoid/cut off people with obvious mental quirks, but the truth is, I think everyone is batshit insane in their own special way. Sometimes, it takes more time to figure out, sometimes it’s obvious from the get-go. So maybe we should all be more open-minded towards each other. The worst that could happen if you listened to “crazy” people more is that you’d waste some time – the best thing that could happen is that you could learn something new, hear some interesting story, make them feel like someone is listening. In LA, I had a strict policy of not engaging anyone “crazy” that started talking to me… no eye contact, no response of any sort, etc – but here in San Francisco, I’m in a more indulgent mood. The other day, I had a 20-minute conversation with a really strange man sitting next to me at a coffeeshop about heremetic rituals, geomancy, alchemy, etc. And why not? Regarding your question, I used to say "everybody is normal until you meet them." This came up recently as I was discussing with someone the new edition of the DSM coming out soonish. "Normalcy" is a mongrel concept and has suffered greatly from being reduced by clinical psychologists (and society as a whole) from a normative question to a statistical one. This is deeply problematic and begs the question of whether the concept has any merit in it at all. A lot of behavior today deemed “normal” was once considered outlandish (and certainly the opposite is true as well). If normalcy is simply a statistical question, then it is a capricious concept, and therefore cannot be a standard. With no standard, who is to say what is a “quirk” or mental illness and what isn’t? I read this book when I was a kid and it made an enormously powerful impression on me. It was one of the most formative books of my life. 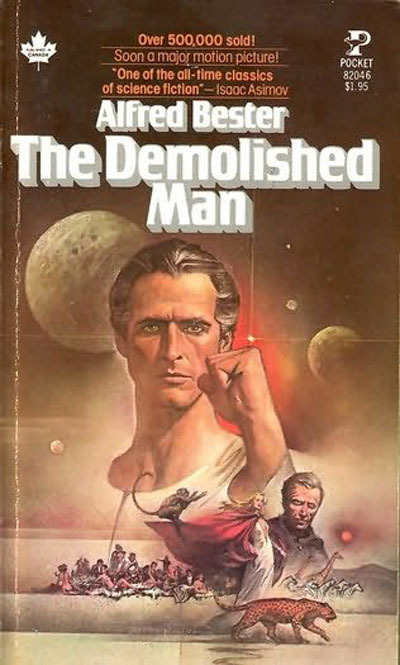 The Demolished Man is not only a great sci-fi novel but a great novel, by any standard. Bester had tremendous range and power as a writer. There will never be another like him. The way you described the murderer-detective focus of the plot line reminds me of Dostoyevsky’s Crime and Punishment; I immensely enjoyed the latter, so I’ll surely read the former at the first chance. There is in fact a direct line from this book to cyberpunk. Samuel Delany has said that when he started writing one of this goals was to create that same sense of wonder that Bester’s novels had inspired in him; and William Gibson similarly avowed the influence of Delany’s great ’60s SF writing. QED.